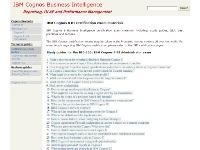 Details: Free study guides for the BI0-122 IBM Cognos 8 BI Administrator exam. It includes sample Questions with Answers, best practices, analysis of the topics users may encounter on the exams, as well as examples with tips and explanations. Definitely a must for all Cognos administrators preparing for the exam.